I love many of the statues in Oslo, but this is one of my favorites. is stationed at Solli plass, just down the street from our place. Nearby stands a larger-than-life, stooped-shouldered Winston Churchill. But Sønsteby is the one who catches the eye. It could be his posture, relaxed but alert; it could be his bicycle. 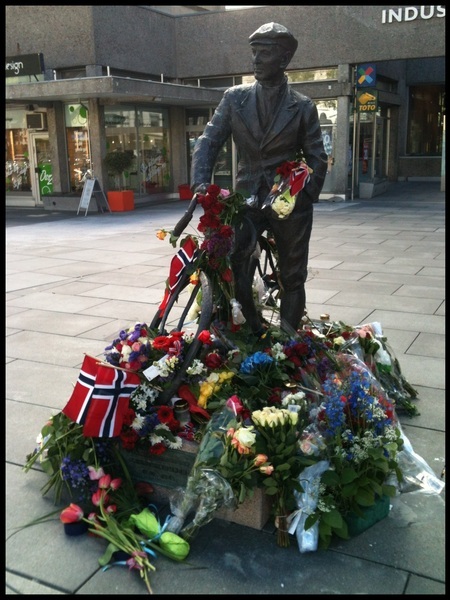 Today it was the pile of roses and flags at his feet and tangled in his handlebars. Sønsteby was the most famous member of the Norwegian underground during WWII. To this day he remains to be the most decorated person in Norway's history, receiving awards and honors and medals from both the Norwegian government and the American government for his efforts during the Nazi occupation. He was known (or unknown) as Agent 24 during the war, and received saboteur training in England. All around, a pretty brave, pretty cool guy. Sønsteby passed away last week (10 May) at the age of 94. As a lover of history, it's a beautiful thing to see appreciation expressed for this man and his personal efforts and sacrifices so many decades after the fact, by way of flowers and flags.